Once the Agent will be created, Unique UserID for Agent will be generated by its own. Agent screen will display Name, Email ID, Role, etc all the basic info of the Agent. You can Edit or Delete and agent with Action button given in below image. If you want to add New Agent, just need to enter few details and Agent will be live(If already purchased). You can assign role to the agent and “Save” the details once all the details is filled. 1.Administrator would have all the admin level access of the dashboard and permission to alter nearly all the aspects of dashboard/agent details. 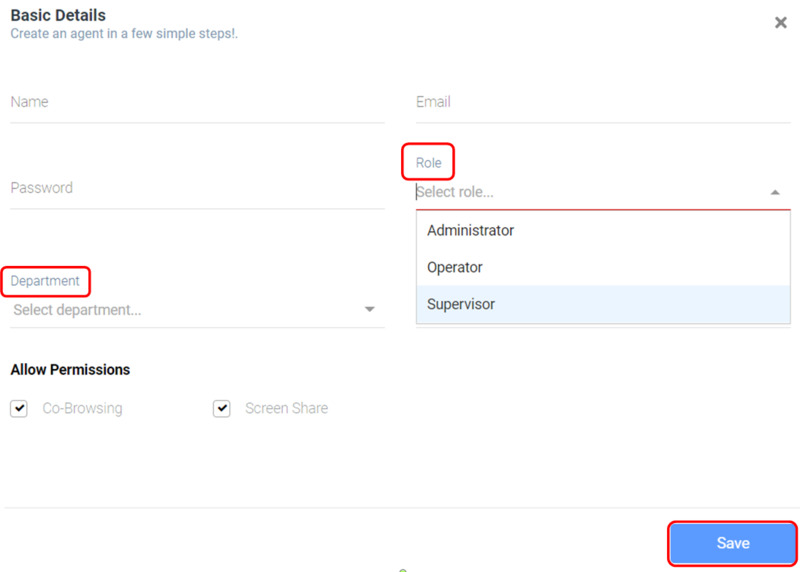 2.Supervisor would be a tier lower than Administrator and could supervise other operator but can't change or alter much details of the dashboard. 3.Operator would just be able to chat and access few basic features as home, profiles and account details.